Our Large Print Gift of Prayers has gone Deluxe! Our pocket-sized Gift of Prayers is our best selling product, and is available in four editions, including this new deluxe large-print edition. It is perfect for the aging “baby-boom” Bahá’í or seeker whose “arms are too short” for their farsighted vision. What makes this edition “Deluxe?” We’ve enlarged the size by 3/4″ in both directions, which allowed us to expand the type 13% to 17 point. We’ve also switched to cream-colored paper, which creates less glare, and added a matching cream-colored cover with square binding instead of a staple. This is a full-service prayer book, with over 100 prayers and short quotations that match our original edition page-for-page so you can let children and older readers follow along when the rest of the community uses the smaller editions. 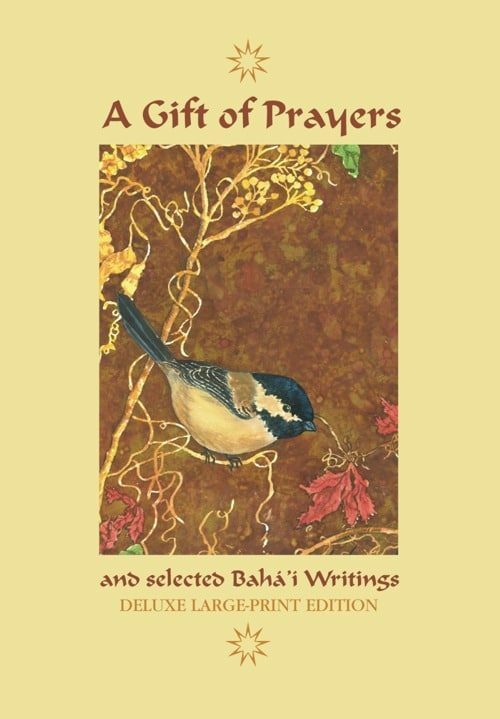 This is especially important with prayers, since Bahá’ís often read them out loud in meeting and many people are hesitant to admit that they have trouble reading the small type found in virtually every other prayer book. We’ve priced them the same as the paperback edition of the American prayer book, so you can afford to give them as gifts. You can also give them out at displays, donate them to hotels, hospitals and nursing homes, or just keep one around the house. Don’t forget to add the best selling smaller edition.